Okay, everyone must have willed the postie along, because he brought me a ‘we missed you’ card today. I’m really hoping to get up there to the sorting office and find a bundle of parcels tomorrow, so can you all keep your fingers crossed for me again please? 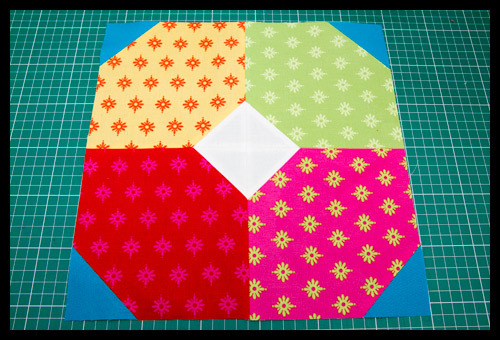 In the meantime, I got the first 2 blocks for the Sew Happy Quilt QAL done. If you want to get in on the x and + block swap, signs ups are tomorrow, although feel free to get some in before then! You can make blocks in multiples of 5, and get the corresponding number back. I’ve decided that for everything I sew, I’ll make a block with the same fabric, which should be a bit quicker than trying to cut everything for them and making a pile at one time, although I may do that in a few weeks if I need to make up numbers! Love that + and X block…and my cake arrived today! I sent you a photo! 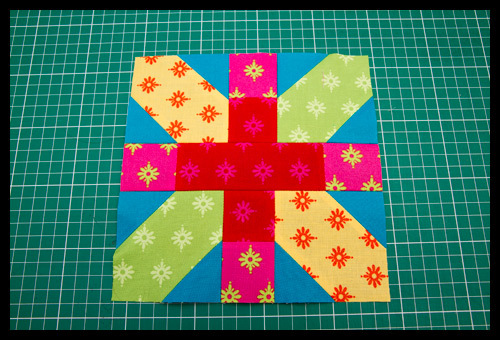 ..I will keep my fingers crossed for your pile of fabric too…love what you've done with these blocks! Getting lots of work done with Jack on the naughty stair? I have a new word to describe you – industrious – it's a good thing! I like the first block the best but they are all very colorful and pretty. Went to a quilting marketplace today and couldn't help but think of you and wondered what you would choose from the various fabric vendors. The woven one looks tricky! Clever you! Good for you! I love that woven block. Looks tricky, but fun. 🙂 Hopefully Postman Pat will have exactly what you've been looking for. Pretty! Such bold colors! I like! oooh, i especially love that woven block! Love those blocks, especially the woven one! Fabulous fabric choices too! Oooh, I love the bright fabrics you are using!! Your blocks are gorgeous! You've gotten lots done! Great blocks. Love the colour! And good luck with the post office. We will be waiting to see what you get! The + and x block looks really great! This swap was such a good idea and I can't wait to see what you get back from it. The fabrics you're using are really nice and vibrant! I must say I love the woven block as well, although I like all the colours. They are so bright and happy. I`m feeling so behind! Great blocks Kati! I am utterly in love with your fabrics!!!! and that woven block – where did you get the pattern for it? i LOVE that x and + block. awesome contrast! I love each of those blocks!! Awesome strong bright colours!! That is gong to be so lovely and bright. I love it! Those are so bright, that will be one eye-popping quilt! Very nicely done. I especially like the Japanese block. Your blocks look fab! I have to ask what is the name of that pink you've used – Its sooooo pretty! 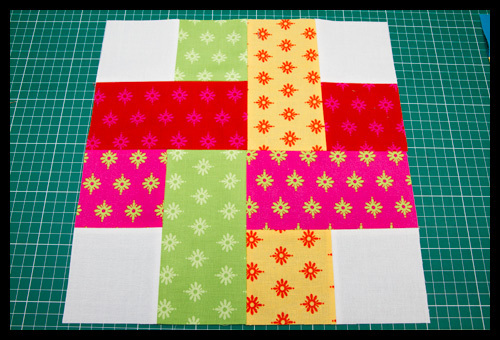 Here from Love Affair…Such pretty blocks. Those fabrics are wonderful! That's a good idea to make the x and + blocks from as you do other projects! I get fidgety when I have to cut weird small amounts of things from big pieces of fabric, and this way you won't have to do that!